Trains are fun for young and old alike. These quick and easy paper train cutouts make a great rainy day craft to do with your kids, or you can dress them up to create fun household decor items such as table centerpieces. These patterns are ready to print, color, and assemble. Cardstock is the best paper to use for the trains because it is more rigid than printer paper. To use these patterns, click on the template of the train you want to make to open the Adobe file, then download and print the pattern. Assembly is simple, but make sure you allow some time for the glue to dry before playing with your paper trains. Color the train pieces before cutting them out. This makes dealing with the smaller pieces, such as the tabs and wheels, much easier. Carefully cut your train out following the solid black lines. You will notice two solid lines running through both engine pieces - one under the front window and one that will allow the hood to fold down. Don't forget to make cuts along these lines as well. Cut out the marked hole for the chimney pipe to fit into onto the hood of the engine. 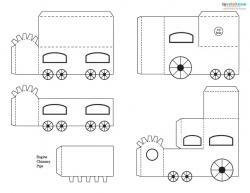 Once your train is cut out, fold the pieces on the dotted lines towards the back or white side of the paper. The exception to this is the chimney pipe, in which the tabs are folded up. Slightly bend the tops of the cars and engines to make them easier to attach in the next step as they must be arched for the pieces to go together correctly. Before putting the whole train together, glue the chimney pipe to form a tube-like piece. Gently push the pipe through the hole on the front of the engine from the inside of the train pattern to the outside. Glue the tabs of the chimney pipe to the inside of the train. Glue the thin folded areas to the edges, including the tabs. The best adhesive for this project is basic white school glue. Once the train is glued together, straighten the wheels if needed and mark where you wish to attach the pieces together. Poke a pencil tip or plastic needle through the paper to create small holes for attaching. Attach the train cars together using your choice of material. The trains shown here use metallic craft cord and earring thread chains. Use tape to attach the ends inside the car and engine. Paper trains can be decorated with anything you want - crayons, markers, paint, or colored pencils. Make your train unique by using a variety of materials. Add glitter, stickers, or other small embellishments. Glitter markers contain a watercolor type ink with fine glitter in bold, bright colors. Metallic markers use ink that has a steel-like cast to it making the paper look like metal. Designer duct tape comes in various colors, finishes, and designs. It can be cut into various shapes to stick to your trains. Make windows, wheels, and other parts of your train glow with a glow-in-the-dark paint. Kinetic Foam is a really fun way to cover your train, but you may need to support the inside with a wooden block or other solid item to keep the paper from collapsing under the weight of the foam. 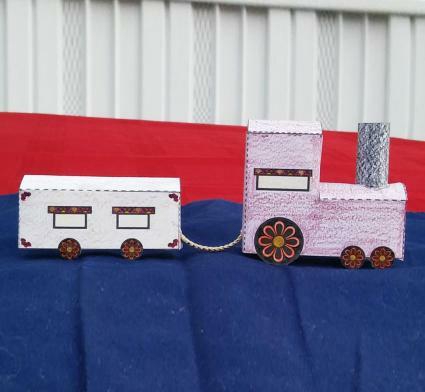 If you're looking for even more paper train designs, try one of these fun options. 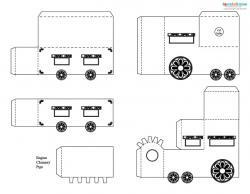 Tweetsie Railroad offers trains that are ready to print and color as well as those that are already colored. The patterns are free PDF downloads with instructions as a separate download for each train. Tweetsie Railroad also offers station sets and town sets to construct your own paper train display. RXRModels.com features more detailed trains with pre-printed designs. The templates are sold as PDF downloads that range in cost from free to less than $5. The trains may be printed an unlimited number of times after purchase. Fun Decorations 4 Christmas offers a free download of a Christmas train complete with engine, train car, and caboose. Instructions for assembly are also included in the download. These trains can be used in a variety of ways aside from a simple children's toy. Tape a strip of cardstock to the bottom of the train to make a surprise candy or gift box. Used boldly colored trains as a playful centerpiece for a circus themed party. If you have a tabletop Christmas tree, set a paper train up in front of it to look like it circles the tree. Create engine cars to use as place cards that can be taken home after a special meal. Color the cars, one for each guest, and add your guests' names in metallic marker. 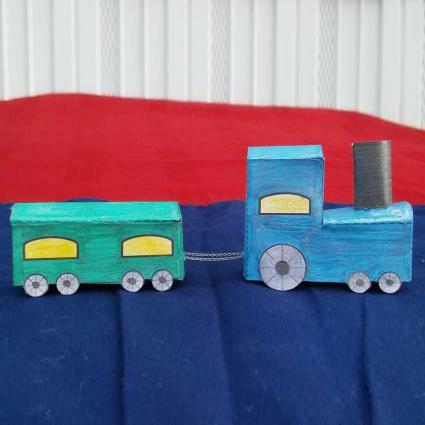 Paper trains are an easy craft to color and construct. You can make them with your kids for something to play with or turn them into something much more elaborate. Engineers of all ages will love them!